The MCL31 Dermablate Erbium:YAG laser ablates the skin with a degree of precision that can be measured in microns and can be carried out as a fully ablative or fractional process. This makes it possible to safely and gently remove a wide variety of lesions from the skin at epidermis and dermis level. It also allows both ablative and fractional skin rejuvenation. The wavelength of 2,940 nm of the Erbium laser matches the maximum peak of water absorption (water is the main component of the skin). The energy is therefore entirely used for the rapid vaporization of the water in the tissue, which leads to the almost instant ablation of tissue. Due to its characteristics, the MCL31 Dermablate has a significantly shorter healing time compared to a CO2 laser (time for re-epithelialization, erythema, edema). On the other hand, the CO2 laser results in better hemostasis thanks to coagulation. Thanks to the greatly limited thermal effects of the Erbium laser, the procedure is less painful than with CO2 lasers. Patients do not require any anesthesia in the treatment of small lesions. Side effects and risks are greatly reduced with this laser. The safety of this treatment makes the Erbium laser the superior choice for delicate areas such as the periorbital region or even the neck, chest and hands. 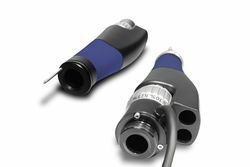 The patented handpiece design guarantees an effective and simultaneous aspiration of the ablated particles, at the same time as the emission of the laser light is activated by the footswitch. No additional switch is needed and noise is kept to a minimum. This also means that physicians no longer have to purchase a supplementary device or have an assistant present to hold it during treatment. 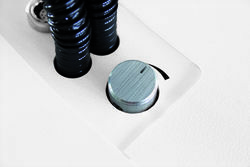 Another Asclepion innovation is the ease with which physicians can now vary the spot size (from 1 to 6mm), simply by turning a ring on the handpiece. 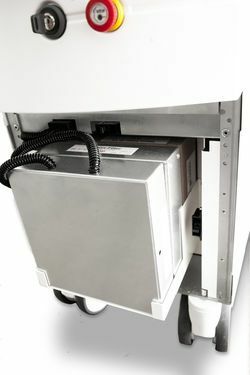 The machine automatically recognizes the change and the laser is immediately ready for use, ensuring considerable time savings and a high degree of user-friendliness. 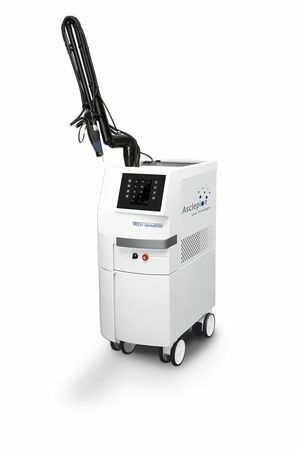 The MCL31 Dermablate is the first Erbium:YAG laser to allow the pulse length to be changed. Thanks to this feature you can work with both extremely short pulses, which guarantee a highly precise “cold ablation”, and with longer pulses “hot ablation” (up to 1000 ms) for a thermal effect on the tissue. The “cold ablation” is particularly suited for purely ablative treatments (for example for the removal of dermal and epidermal lesions) while the “hot ablation” is recommended for rejuvenation treatments, as it effectively stimulates neocollagenesis. The two modes can also be combined, for example in the fractional rejuvenation treatments (where the thermic effect on the collagen can be added to the ablative effect on deep wrinkles) and in the removal of lesions located in the dermis (coagulation mode). Thanks to the thermal mode, the laser MCL31 Dermablate offers the ability to limit any bleeding during ablation treatments with a simple gesture. With this function it is possible to change the mode on the work screen from ablative to thermal in an instant; this causes an instantaneous coagulation and allows the physician to curbing pinpoint bleeding that can occur when working in the deeper layers of the dermis (e.g. in the removal of dermal lesions). In this way the treatment area remains clean and visible during the entire treatment, allowing the operator to work quickly, safely and effectively. The background colors can be adjusted according to personal needs and the three treatment modes are optimized specifically for the applications.